Too much?! Give us a call, maybe we can work something out. Also, ask us about pricing your day or evening event lasting 5 hours or more and about our “neighbor” and non-profit rates. Here are some popular add-ons we offer. If there’s something different you might like- just let us know. We’re flexible and creative – you call the shots … or leave the details to us! Green Screen – Place your guests right on the set: the scene of the crime? the big game? or a tropical location? Backgrounds are available, or give us your ideas… we’ll make it look like your guests are really there! Cost: Green-screen setup fee is $50. Please note, green screen is only available with the 4×6 postcard format, not film strips. Ask for a sample image and we’ll show you how it works. – Any choice of booth set-up requires a minimum of 12 x 12 available space. – Select from one 4 x 6 postcard style OR 2 x 6 classic film strip style printouts. We can split your session to accommodate up to three different versions of the SAME style for an additional set up fee of $50. – We arrive approx. 1.5 hours in advance for set-up and begin breakdown once the contracted time is over. Don’t worry- if your guests are in the middle of a session, we won’t push anyone out – but like at the supermarket, when time is up, we will have to notify the ‘last’ guest in line and alert other guests that the photo booth is closing/closed. If you wish us to remain open longer: if schedule permits, we can stay open in ½ increments for an overtime fee of $85 per each half hour accrued. 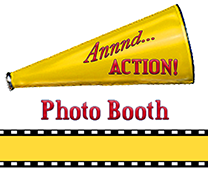 – Set-up requires a dedicated 3-prong electrical outlet within 25-feet of the photo booth set-up area. Safety first: please know, we may need to tape down extension cords if hiding them away from pathways is not an option. – *Social Media and/or email does requires a WiFi connection for real-time sharing, otherwise all posts will uploaded after the event is over. Not available for events scheduled with less than 5 days notice. – We will reserve a time slot for you upon verbal agreement and a $50 retainer will be due at time of contract (within 48 hours) to fully secure the date/time of your event. Retainers are payable via cash, personal check, money order, Paypal (credit cards taken using Paypal). ** BOOK NOW ** Reserve your time & date. *Pricing listed as of October 1, 2018. Prices subject to change at any time.